Whether you are considering adopting a new pet or if you gave a cat or dog a brand new home over the holidays, there are certain responsibilities that must be addressed immediately. If you have not already done so, make an appointment with your local South Coast veterinarian. It is important to make sure that your pet is in good health and that they have received all of the vaccinations and health checks required to ensure a long and happy life. Visit the local veterinary clinic in Dartmouth and bring along any papers that you received from the breeder or place where you adopted your pet. This can help you with vet care for cats and dogs to avoid doubling up on important shots or on missing out on things that are required. Your local emergency veterinary hospital can help you get on track with regular veterinary check-ups, visits, preventive treatments and more. As you have probably already guessed, owning a pet is not cheap. Even if you were given the animal as a gift, there are lots of associated expenses including food, boarding, licensing, spaying and neutering, vaccines, veterinary check-ups and even insurance. Believe it or not, buying pet beds, leashes and toys are going to be the least of your financial responsibilities, so it is important to be prepared to financially care for your pets. Taking care of your pets when you are home – and when you are away at work or running errands – is also part of this responsibility. Make sure you have a crate or a plan for when you can’t be there to supervise. Make sure that your home is prepared for a new pet. Many of the calls that veterinarians get regularly for emergency vet care for cats and dogs with new adoptees include accidents and incidents that happened in a home that wasn’t ready for a curious kitten or a hyperactive puppy. Cats love to climb on just about anything in your home, including shelves that contain family heirlooms, priceless figurine collections and other expensive items. Dogs can be a one-animal wrecking ball, bouncing off furniture, having accidents on carpets and even chewing on cupboards. 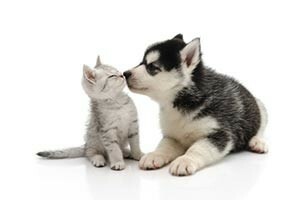 Ask your South Coast veterinarian for tips on kitten and puppy-proofing your home. It is also important to adopt a pet that reflects your lifestyle and the time that you have to spend caring for the new member of your family. Dogs and cats need human companionship, so if you don’t have time to spend with them on a daily basis, you might be better off with a fish or another pet that won’t miss you so much. Dogs need to be walked and played with, while cats enjoy a good cuddle and scratch, however different breeds require different amounts of attention, so it is important to do your research. The problem with all of these breeds is that if they are not exercised daily or challenged mentally and physically with toys, tasks and interaction with their people, they can become bored and, in some cases, exhibit destructive behaviors. This is often the cause of shredded pillows, ripped up couches, gnawed on television stands and holes in carpets. Unfortunately, people don’t realize that they have the key to preventing these bad behaviors just by giving their dogs the activity that they require. Once you identify the best pet for you, or you come to terms with the amount of activity and care that you need to start providing for your existing pet, bring them into Anchor Animal Hospital in Dartmouth to get on a program for vet care for cats and dogs. Making sure that your new family member is well cared for at every stage of his or her life is very important. We operate as a veterinary clinic in Dartmouth for routine care, as well as an emergency veterinary hospital capable of on-site surgeries and treatments. If you are in need of a South Coast veterinarian, contact our facility at 508-996-3731.